Exploring the history and meaning of the 'status quo' on Jerusalem's Temple Mount. Though "maintaining the status quo" on the Temple Mount seems to be a universal goal, no one is quite sure what it is. Those who believe it means that Jews must not pray there should take note that the late Rabbi Shlomo Goren, Chief Rabbi of the IDF and later of Israel, wrote that Jews prayed there for "hundreds of years" up until three centuries ago. When Israeli, American and other diplomats and statesmen speak of maintaining the status quo, they generally mean that Muslims must be allowed free entry for worship or leisure, while Jews must continue to be restricted in their access. Jews, according to this definition of the "status quo," must be prevented from entering in large groups, or at other than several specified daily hours  and from praying at the site altogether. Prime Minister Binyamin Netanyahu and other Cabinet ministers have repeatedly stated of late that there will be no change in the status quo. They have made this clear to Jordan's King Abdullah, the European Union's new foreign policy chief Federica Mogherini, and others. However, this 'status quo' under which Jews do not pray on the Temple Mount actually came into effect only relatively recently. As recently noted by Rabbi Eliezer Melamed in BeSheva, Rabbi Goren, who blew a shofar at the site upon its liberation during the Six Day War in 1967, wrote in his work "The Temple Mount" that "Jewish prayer at the Western Wall began only in the 16th century; prior to that, Jews prayed for centuries on the Temple Mount." Rabbi Goren, a Temple Mount expert, notes that, based on the renowned Radbaz  the 16th century Rabbi David Ben Shlomo Ibn Zimra, whose rulings form the basis of much of accepted Halakhah  and others, "it is clear that after the Amoraim and Geonim [i.e., after the year 1038], the general custom followed the opinion that there was no reason to forbid entry to the Holy Site in its destruction, as the Meiri writes... This is true even when there was no Red Heifer for purification... This practice cannot be attributed to lack of knowledge; it is not reasonable to assume that Jews prayed for centuries at the site of the Holy Temple without anyone mentioning that this involves a grave prohibition, punishable by karet." Of course, the custom gradually changed. The Muslims banned the Jews from entering the holy site, and their "holiest site" gradually came to be the Western Wall  which was actually just a supporting wall of the Temple Mount. 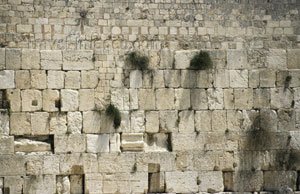 "When the Medrash states that the Divine Presence never left the Western Wall," Rabbi Goren writes, "it does not refer to this wall, but rather to the western wall of the Temple courtyard or of the sanctuary." Rabbi Goren writes that he himself was "bound up in chords of love for the [present-day] Western Wall, where I used to pray every Sabbath and holiday," and that this prevented him from acting immediately after the Six Day War to institute Jewish entry to the Temple Mount. However, "the voice of our cry [in Psalms], 'Who will ascend to the mountain of G-d? ', aroused me to take strength and clarify the matter of visiting the Temple Mount." This he did by assigning the IDF's Engineering Corps to map out the exact measurements of the Mount, and consulting Rabbinic and other texts to clarify the precise location of the Holy of Holies and other forbidden areas. Rabbi Goren attempted to arrange prayer services on the Temple Mount, but was stopped from doing so by then-Defense Minister Moshe Dayan. In any event, the 'status quo' in previous centuries included Jewish prayer on the Temple Mount. After 1967, a new 'status quo' was instituted  one that barely resembles the situation of today. It is very popular to demand nowadays that Israel "maintain the status quo" on the Temple Mount  but barely anyone can say exactly what that 'status quo' is. In fact, the rules instituted for prayer rights on the Mount immediately after the Six Day War barely resemble those in place today. 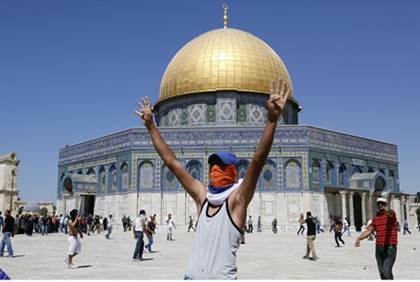 It must be stated at the outset that after the Six Day War, control of the Temple Mount was granted to the Muslim Waqf by none other than then-Defense Minister Moshe Dayan. A very controversial personality in modern Israeli history, Dayan was credited with much of the responsibility for Israel's miraculous victory at the time  and was blamed for much of what happened during the Yom Kippur War six years later. Rabbi Eliezer Melamed, Rabbi of the town of Har Brachah and Dean of its Yeshiva, wrote this week in B'Sheva, "For years, it has been known that there were two sides to Moshe Dayan; darkness and light served together. On the one hand, he was a true Israeli war hero, and on the other hand, he was an adulterer and a thief [of archaeological artifacts  HF]. Apparently, the latter traits tipped the scales against him. [After 1967] he began to lose his public stature; his name will be remembered in infamy." The Waqf, a Jordanian-Muslim religious body, would continue to manage the site. Jews would be permitted to visit the Temple Mount, but forbidden to pray there. Israel's police would maintain law and order in the sacred compound. Israeli sovereignty and law would be applied to the Temple Mount, as to the other parts of Jerusalem. Shortly afterwards, it was also decided that Jews and other non-Muslims would enter the Mount only via the Mughrabi Gate, located at the center of the Western Wall. It also later became prohibited to unfurl any flag on the Mount. "In retrospect," Shragai sums up, echoing the sentiments of many Jews around the country and the world, "the concession Dayan made in the name of the Jewish People was indeed immense, colossal, almost inconceivable. The Jewish State entrusted its holiest place to a competing religion  the Muslim religion, for which the place is only the third in holiness, and gave up the right to pray there." At that time, Jewish protest against the regulations was minimal, for the Jewish public was excited at the prospect of being able to pray at the Western Wall  a supporting wall of the Temple Mount. In addition, virtually all rabbis ruled in accordance with long-standing tradition - and long-standing ignorance of the exact locations of the Halakhically-forbidden areas on the Mount - that entry to the Temple Mount was forbidden. Today, over 40 years later, the above 'status quo' is no longer in effect. For one thing, religious Jews now clamor to be allowed in  as the boundaries of the permitted locations have become well-known. In addition, they fear the loss of Israeli sovereignty there, and are convinced that their frequent visits to the site will prevent this. Under the original arrangements, Jews were freely allowed to visit the Mount  but today, such visits are often restricted. They may ascend to the holy site only five days a week, for three hours in the morning and one in the afternoon. Even these few hours are often removed from the Jewish itinerary when Arab incitement and unrest portends violence in the area. Religious Jews may visit only in small groups; visitors are often forced to wait for hours until those in front of them in line have completed their visits. Even then, they frequently are not allowed in. In addition, the prohibition on raising flags on the Temple Mount is enforced only in the case of Israeli flags, but not when Hamas or Palestinian Authority flags are unfurled. When Knesset Members and other public figures such as Temple Mount activist Yehuda Glick (still recovering from the critical wounds he suffered in a near-fatal Palestinian assassination attempt) call for Jewish prayer rights at Judaism's holiest site, they are often accused of trying to change the 'status quo.' Their critics should be reminded that the 'status quo' has already been changed very heavily  to the exclusive detriment of Jewish would-be worshipers. Parts I and II have shown that the "status quo" on the Temple Mount is not quite all it's been hyped up to be. It certainly is not an all-out ban on Jewish prayer on the holiest site to the Jewish People  because for hundreds of years, up until possibly 300 years ago, it was frequently used for just that purpose. Jews visited the Mount often and prayed there regularly. On the other hand, if the "status quo" refers to the arrangements put in place after the Six Day War in 1967, they have long been changed  and to the detriment of Jewish rights there. It is ostensibly illogical to demand retaining the "status quo" to forbid Jewish prayer on the Temple Mount, while changing the "status quo" in order to much more severely restrict Jewish visitation rights. 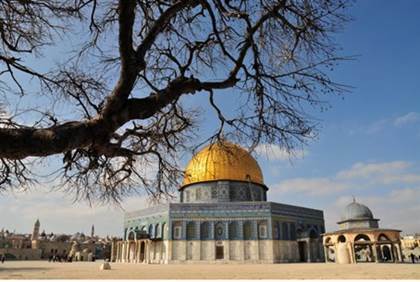 In any event, latest research regarding the construction of the Dome of the Rock  the magnificent structure that stands atop the site of the Holy of Holies  shows that it was originally built not for Muslims at all. Rather, it was built for the Jewish People! "The Al-Aksa Mosque [at the southern end of the Mount, opposite the Dome of the Rock  HF] was built as a Muslim house of prayer outside the boundaries of the original Temple Mount, and therefore it points southward towards Mecca. And at the request of the Jews, Omar built the Dome of the Rock sanctuary to serve as a house of prayer for the Jews. This was after the Jews showed him the site where the Holy Temple had stood  and it does not point to Mecca." Rabbi Goren clearly delineates between the two buildings: One is in the direction of the holy Muslim city of Mecca, and is to serve as a mosque  while the other was built without regard to Mecca, and only at the guidance and request of the Jews. "In this year [635 C.E. ], Omar began to restore the Temple at Jerusalem, for the building, in truth, no longer then stood firmly founded, but had fallen to ruin. Now when Omar inquired the cause, the Jews answered saying, 'Unless thou throw down the Cross, which stands on the Mt. of Olives, the building of the Temple will never be firmly founded.' Thereupon Omar threw down the Cross at that place, in order that the building (of the Temple) might be made firm..."
How ironic it is that this is the true background of the building that now symbolizes, throughout the world, Moslem control of Judaism's holiest site  and the ban on Jewish prayer there. When next is heard a call to return to the "status quo" on the Temple Mount, let it be clear that this means nothing less than full Jewish prayer rights at the holy site  and possibly even much more.